Chicago Bulls coach Tom Thibodeau is far from fretting over the heavy minutes accumulated by his team's leading scorers, Derrick Rose and Luol Deng -- both of whom played almost 45 minutes each during Tuesday's stunning 76-74 victory over the Atlanta Hawks at the United Center -- early in the season. Deng is averaging about 39 minutes in six contests. Last season, the veteran small forward was third in the league in minutes per game (39.1) and figures to be near that mark again this year. Meanwhile, Rose has received 36.5 minutes per game in 2011-12, lower than his average a season ago (37.4). But with C.J. Watson sidelined indefinitely because of a sprained left elbow, Rose could see more nights like Tuesday, when he played the entire second half as the Bulls came back from a 19-point deficit. "Derrick and Luol are accustom to playing big minutes," Thibodeau reiterated to reporters afterwards, "so I thought they were fine. "You can't say enough about Luol. 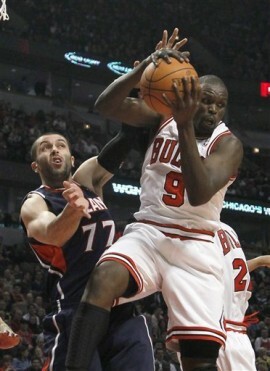 Luol does everything. He rebounds, he defends, he cuts. Active, tough, smart." Hamilton likely to play vs. Pistons in Detroit: Although Rip Hamilton missed his second consecutive game Tuesday due to a strained left groin -- which he suffered against the Los Angeles Clippers Friday -- he dressed and appeared to move around and shoot well during the pregame shootaround. And by the sounds of it, Hamilton's teammates expect him to play in Wednesday's road game against his longtime former club, the Detroit Pistons. "As a player, being in a certain place for a long time and then going back ... he won a championship for that team," Bulls forward Carlos Boozer told the assembled media Tuesday, when asked about Hamilton's return to The Palace of Auburn Hills. "They'll probably give him a warm applause and well deserved. He got a championship there, been there for almost 10 years. I think he was there for nine years. They won a lot ... It will still be different. [For] everybody to see him in a different uniform will be different for all the fans." With the Bulls having started a jam-packed slate of January games that feature five back-to-back sets and the one and only back-to-back-to-back, it made plenty of sense for the Bulls to keep Hamilton out of Tuesday's game, given that he clearly was not ready to return to the rotation, and re-evaluate him on Wednesday. In addition, the veteran shooting guard probably wants to get his matchup against the Pistons in Detroit out of the way. The two teams don't play in Detroit again until April 15. Ronnie Brewer, who has started at shooting guard the past two games and posted four points in 23 minutes Tuesday, would start again if Hamilton is out against the Pistons. Asked Monday about Wednesday's tilt in Detroit, Hamilton smiled and said he's only focused on the Hawks. "It's a lot of games in a short amount of time, and anytime you get a groin injury you don't want to rush it," he added. "I've had it in the past. It's just one of those things we just want to be very careful about."